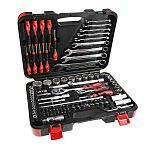 Tool kits offer a selection of different hand tools and are usually supplied in a box/casee or a bag. 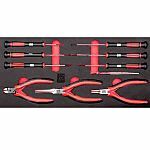 These sets of tools are normally grouped by a particular purpose or type of tool. For example, you may see an electricians tool kit with a variety of different tools for this specific field. On the other hand, a screwdriver kit will have a number of different screwdriver types within it and will have broader applications across more fields. The number of tools within a kit can vary greatly, from two or three pieces into the hundreds.